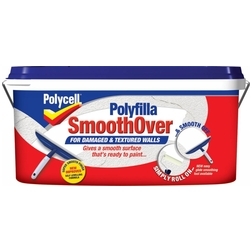 Polycell Polyfilla SmoothOver for Damaged & Textured Walls is the easy way to create a perfect foundation for a great finish. Its special self-levelling formula fills between ridges and bumps and covers cracks and large areas of damage giving a smooth finish that’s ready to paint. Creates a smooth and even foundation ready for painting. Quick and easy to apply for a quality long lasting repair.